Expertly crafted in a Mid-Century Modern design, this pair of barrel back dining chairs is understated and versatile. Classic and comfortable, these chairs have enough support to cradle your back while still creating a slim shape that saves space in smaller kitchens and dining rooms. 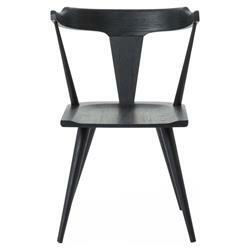 Finished in black oak, their silhouettes are strikingly stylish.